Acura NSX Makes A Splash On The Test Track: How Does It Measure Up To Competition? This car could not be more different than its predecessor. The Acura NSX has created a stir since the guys at Honda’s luxury brand announced it because the new car is nothing like its analogue ancestor. Instead of spartan simplicity and bulletproof build quality, the NSX is a technological masterpiece complete with a nine-speed double clutch transmission, multiple driving modes, and a supercar trinity-like hybrid drivetrain. The NSX launches from 0 to 60 mph in 3.0 seconds using three electric motors and a 3.5-liter V6 to pump 573 horsepower to all four wheels. The Acura has the lowest center of gravity in its class, which is afforded by the extensive use of aluminum and carbon fiber. 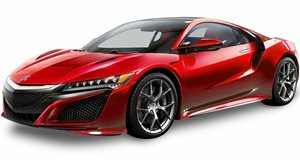 The Acura will cost buyers a full $110,000 more than the 2005 NSX’s $60,000 base price. This puts the estimated $170,000 supercar in Porsche 911 Turbo and Audi R8 territory. Unlike its supercar peers, the NSX does not want to be shouty; it even comes with a “Quiet Mode.” Acura’s aim is to create a comfortable everyday usable supercar that shines at the track and is a breeze to own. Unfortunately, the NSX seems to have fallen short. It is a great daily driver like most Hondas, but it is too soft for track excellence and looks like a geeky take on the everyday supercar. Like the BMW i8, the car looks like a fuel sipping sports car rather than a rabid monster like a Ferrari or Porsche. While Acura does well reviving nostalgia with the NSX, it fails to be as good of an everyday supercar as the $55,000 cheaper Audi R8.